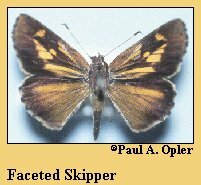 Identification: Upperside is dark brown with orange patches. Underside of forewing is similar to upperside; hindwing is mottled brown and gray with a dark triangular area on the leading edge. Life History: Adults fly swiftly, most often in the afternoon. Adults rest with their wings closed, but bask with hindwings open wide and forewings open to about 45 degrees. Males perch to find receptive females. Caterpillars live in shelters of silked leaves. Flight: August in southern Arizona, much of the year in Mexico. Caterpillar Hosts: Not reported; probably grasses, sedges, or rushes. Range: El Salvador north through Mexico. One stray from Mexico was reported in southern Arizona.